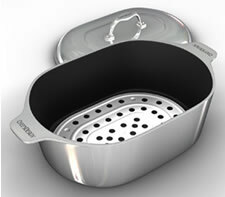 Chefs Design Covered Oval Roasters are destined to be the gourmet's favorite for roasting, braising, steaming or poaching. Manufactured to the highest culinary standards, these heavy aluminum roasters offer unsurpassed cooking performance. Busy cooks will appreciate the self-basting cover. The "dimples" on the inside of the cover collect rising cooking vapors, which condense on the dimples. This condensed liquid drips onto the food cooking below, keeping the food completely moist and flavorful with out additional basting. Includes Anodized aluminum meat rack & care & use sheet. Interior dimentions: 18" x 12.5" x 6.5"
Exterior dimensions: 21" x 13" x 11.5"